Speculation is the sexiest of all Magic money-making endeavors. It is the perfect mix of the American dream and the allure of making a quick buck. Get a great idea or an inside lead on a card, dump a ton of cash into it, and make a 600% profit in two weeks that most stock portfolio managers would quite literally end the life of another human being to make. Not only does this require little effort to achieve, with the total sum of your hard work being putting cards into envelopes and taking them to the post office, it makes you look like a genius. Every time the topic of speccing comes up there’s that one guy that never fails to mention how he bought out Snapcasters at $6 during preorder or some such. Of course, the reality of the situation is nowhere near that easy or glamorous, as few things are. Finding an angle on a card that nobody else has seen yet is tough when there are thousands of other people staring at the same finite card pool you are. Selling the cards is sometimes easy, but not always. If you don’t mind taking a smaller profit and just buylisting them it isn’t bad, but if you want to squeeze out every penny or the lists haven’t caught up yet you’re left spending time listing on eBay and dealing with overhead costs. None of that is too bad if you bought a few copies, but the times you make real profit is when you have hundreds of a given card. Knowing all this, how do we succeed in picking good specs? What is the magic formula for identifying the next hot thing that is going to go from $.80 to $7.99? You already know the answer to this. There isn’t a magic formula. It requires constant awareness of the market, a pulse on multiple information sources, and no small dash of luck. After all, even if you get ahead of the market and buy 300 Krark’s Thumb, there’s no guarantee they’re all getting shipped to you if the price rises before the cards leave the warehouse. Today we’ll look at a few factors to consider when trying to decide if you should go deep on a card. The important thing to remember is that all of these headings are factors, but not necessarily deciding factors. Sometimes cards rise in spite of particular circumstances. If you have an eye on a card that looks great in most of these categories but not all, don’t immediately toss it out the window. Just be sure that you’re making the decision for the right reason. In a vacuum, how powerful is your card? Does it do something inherently broken, such as Birthing Pod? Is it just an excellent rate for its effectiveness, ala Tarmogoyf? Does it tutor as well as Infernal Tutor does? This is always one of the most crucial questions when evaluating a card, and also one of the most difficult. This is the one where you really get to say “I saw things different from the rest of you, and I made money because of it,” and it’s also the one that gets egos involved the most. A lot of money can be made when you see things differently from others. Chapin saw the power of Jace and bought something like forty copies at $25 apiece when it was spoiled. More recently, there were people out there that realized Desecration Demon was a dangerous threat only being held back by the presence of Lingering Souls. They were rewarded after rotation for recognizing the card as being very powerful, even if the meta hadn’t borne it out yet. Powerful cards aren’t always expensive and expensive cards aren’t always powerful, but in general the better the card the more likely it is to be expensive. If you spot a powerful card that isn’t already expensive, ask yourself why not. 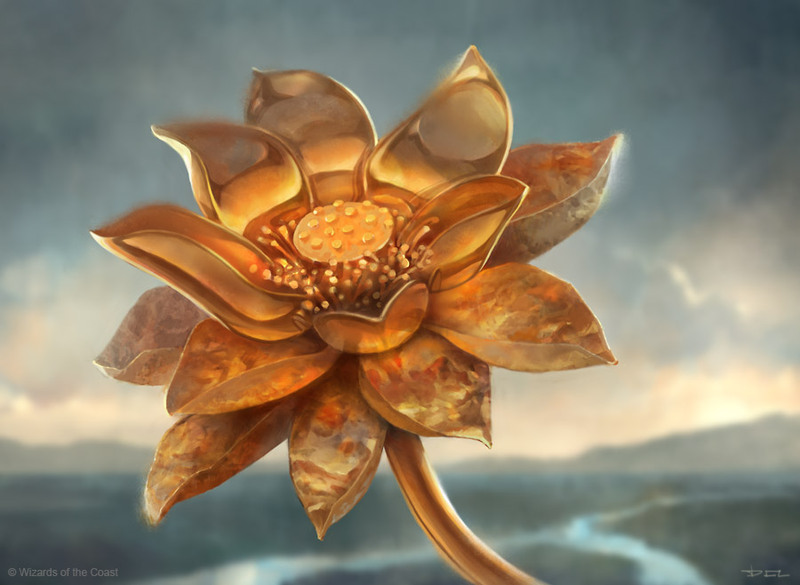 You may look at Isochron Scepter and think about all the dirty things you can do with it in Modern, but remember that artifact hate is all over the format, as is Abrupt Decay. Without even considering the quantity of copies available we already see why an inherently powerful card is basically metagamed right out of Modern. Meanwhile, there are definitely very powerful cards that exist in that format that just haven’t been figured out yet, or whose crucial combo piece has yet to appear. If you can look at Vampire Hexmage in the spoiler and immediately realize Dark Depths is sitting out there at $2, you’ve got a leg up on the rest of us. What’s the major difference between Precinct Captain and Auriok Champion? Thousands and thousands and thousands of copies. The price of a card, of any good, is a factor of supply and demand. Demand is an incredibly complex component but at least supply is easy to figure out. There are so many more Precinct Captains than Auriok Champions it’s no wonder they are separated in price by a decimal place. If demand for the two cards is equal and there are ten times more Precinct Captains out there, then it isn’t surprising that Captain is about 1/10th the cost of Auriok Champion. The more copies of a card that exist the harder it is for the price to rise astronomically. This is why very old cards rise much easier than new cards. When judging how many copies of a card are in the wild the first thing to consider is what set(s) it is from. Assume for now it is a single printing in an expert expansion. The further back you go, the richer the vein. My three mental bookmarks are Mirrodin, Future Sight, and Innistrad. Mirrodin is a point of reference because then the card is legal in Modern. If we’re looking at a card from Onslaught or earlier, it is limited to Legacy and Casual formats. That isn’t a death sentence or anything, but it’s important to consider. Anything printed between Future Sight and Mirrodin is excellent territory, between Future Sight and Innistrad is solid, and after Innistrad the card has an uphill battle. There were just so fewer cards printed in sets prior to Future Sight relative to today. That is a major reason why many Modern staples have gone nuts; there are just so few copies available in the market compared to how many players are now in the game. Every set from Zendikar on has seen a growth in the player base, but between Innistrad and Return to Ravnica specifically we’ve added a tremendous amount of players. Second and third printings complicate things a bit. Again, the older the additional printing, the better. If a card was printed in Mirrodin and then again in Kamigawa, we aren’t too worried. The price has had plenty of time to settle into where it is today. If it was in Mirrodin and then Gatecrash, that’s another story. Auxiliary product, such as Planechase or Commander decks, has some impact as well. These are much smaller runs than full expansion sets, so they aren’t exactly flooding the market. Special product printings will typically slow the growth of something, but not suppress it entirely. When considering specs for Standard play, pay close attention to which set they’re printed in. The Return to Ravnica block had a unique structure in that the card pool was split pretty evenly amongst RTR and Gatecrash, while Dragon’s Maze was opened far less. This opened the door for DGM cards to spike harder than their RTR/GTC counterparts because there were so many less available on the market. Theros’ distribution will have a similar impact on viability of speculation targets. Theros will be heavily opened, while Born of the Gods and Journey Into Nyx will be less so. A good example is the two black Bestow cards Nighthowler and Herald of Torment. Nighthowler is from Theros, making it a much worse Standard target than Herald. There will be about three times more Nighthowlers on the market than Heralds without even counting the Gameday promo. The full ratio of packs opened across the block will be 6:2:1. Seeing that type of ratio should really help you understand why Born, and to a greater extent Journey cards will be such better spec targets than Theros. The takeaway from all of this is that the less copies of a card in the market, the better your spec looks. That isn’t the only thing you need to consider, but it’s an important one. Don’t just check a single storefront either. I’ve been burned before by seeing only a few copies on TCGPlayer, buying several playsets, then realizing there are huge stocks still available at SCG or ABU. You need to do your homework and see just how much is out there before deciding if your pick is a good one. And don’t forget about eBay either. When considering a card, ask yourself how many the prospective player needs. Is it central to a deck’s strategy, as Living End is to its eponymous deck? Is it a one-of silver bullet? Or an occasional sideboard card? The amount of copies players need of a given card figures into the ‘demand’ side of the equation. If I want to play Scapeshift, I may want a few Obstinate Baloth. Probably not all four though, and I can get by without them if I have to. I can’t play without owning four Scapeshift, though. The general rule of thumb is that sideboard-only cards make poor specs. That isn’t to say it can’t happen, but the card typically has to be ubiquitous in sideboards to make a solid run. Spellskite is the most well-known sideboard card that has done well for itself, and even in that case it only went from $6 or $7 to $16 or $17. A $10 increase is nothing to sneeze at, but if it was somehow central to a strategy the card would be $30+. Cards that need to be in the maindeck as a full set are a good choice. Cards that appear as a one or two-of in sideboards are not as appealing. Artifacts that every single EDH deck will want are universally desirable. Cards that are only useful to an unpopular general are less so. How many other cards do what your card does? Restore Balance and Living End are the only things that accomplish their particular goals. Nobody is building a Living End deck that doesn’t run Living End. On the other end of the spectrum, Obstinate Baloth isn’t exactly unique. Sure, it’s very useful against Blightning and smaller aggressive decks. But so are Kitchen Finks and Loxodon Smiter. If the card you’re considering could be pretty easily replaced by a much cheaper option, you may want to look elsewhere. Part of what made Living End such a juicy pick was how cheap the rest of the deck was. Aside from the manabase, most of the deck is commons and uncommons. If a player can pick up fifty-six cards of a sixty-card deck for $100 then they’re going to be far more willing to spend ten or twenty or even thirty dollars on the lynchpin of the engine. However, if the deck is packed with Goyfs and Cliques and Snapcasters the list is already going to be atrociously expensive to buy into. Player’s willingness to fork over serious cash for some novel new tech is going to be far lower. I don’t recall exactly what the first card to spike because of Nekusar was, but I know it has happened to several by now. Cards that force your opponents to draw extra cards are all prime candidates at this point, especially ones that attach penalties to them. When Seizan popped up on my MTGPrice insider email, I knew the card would be rising soon. It makes other players draw extra cards and gets them for a few damage at the same time. It hasn’t fully taken off yet, probably because the effect is smaller when compared to things like Wheel of Fortune, but I expect it to eventually make a full jump to $8+. Price history is an excellent way to spot cards that are moving up and possibly poised for big jumps. A card may seem underpriced, but is its price graph flat for the last year? Or has it in fact been slowly rising for awhile? A flat price history doesn’t doom the card, but it does mean that there hasn’t been much interest in it for awhile. However, price graphs that have been trending up indicate growing demand for the card, a big indicator for price spikes. Keep in mind the old legal disclaimer of “past results do not guarantee future returns” though. What is the market for your card? Is it a Sphinx’s Revelation type of effect that is pure raw efficiency but otherwise an entirely boring card? Or is it a Vigor, something that your average PTQ grinder will scoff at but your younger cousin will be in awe over? Tournament staples tend to spike harder. The players with their fingers to the competitive scene will get whiff of a major contender on the rise, buy in early, and soon after the rest of the market will realize what is happening and finish off what’s available. The card will relist at ten times what it was, and eventually settle to its real price point, whether its actually ten times the old price, or only $.50 more than it used to be. Demand comes quickly, and it leaves quickly too. Rotations crush cards like Sphinx’s Revelation because once it’s off the radar of the grinder there’s no market left for the card. These are the types of specs that you immediately sell into the hype because there’s no way to tell where the card is going to land and you want to make sure you capitalize on the frenzy. Casual cards, on the other hand, are guaranteed slow burners. There are less severe spikes on these types of cards because there are no tournament results or rotations to worry about. There are simply millions of players in their kitchens, collectively buying a playset of Consuming Aberration at a time, never trading or selling them, slowly but surely driving the price up. These cards do still spike on occasion when the MTGF community gets ahold of them and speeds the process along, but for the most part they get there on their own. Knowing which market wants your card and what to expect out of its projected growth pattern is important for identifying short-term and long-term holds. Even if you know for a fact a given card is going to triple in price, if it’s going to take a few years, you may rather operate in a faster market. I could (and did?) write an entire article about how easy or difficult it is for a card to be reprinted. The long and short of it is that the easier a card is to reprint, the less secure your purchase is. A card like Spellskite was juicy pickings because Phyrexian mana is unprintable outside of a Phyrexian block or smaller-run auxiliary product. Vendilion Clique is a tough reprint because it’s a named legendary creature with a specific creature type. Linvala, on the other hand, is not tied to any specific plane or keywords. She’s a generic angel which show up in nearly every single set. That isn’t to say that Linvala is getting printed in Journey Into Nyx, but it’s far more likely we’ll see her there rather than another printing of Birthing Pod. Take a look at the gap between the lowest retail price and the buylist. MTGPrice shows you this automatically on every page. The narrower the gap, the better your odds are. 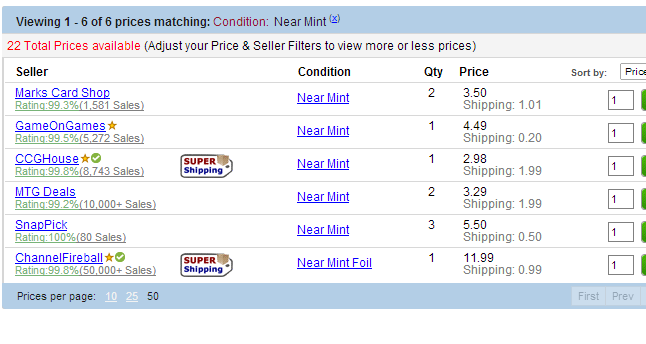 If the highest buylist is 30% of the lowest price, it means there isn’t demand from vendors to get copies into stock. They’re selling so few copies of the card that they aren’t in a rush to get more. A narrow gap means vendors are eager to have any copies they can in stock, and a rise on the purchase price is probably close behind. You’ll see a lot of MTGF types on twitter always talking about the gap on a card, and this is usually what they’re referring to. Assume your spec bombs terribly. What is your out? How badly do you lose, and what can you do to mitigate it? If you’re buying your spec at $3 each and the best buylist is $.50, you’ve got a long way to fall. You’d basically be committed to holding onto the card indefinitely, until either it does actually spike or the buylist rises. 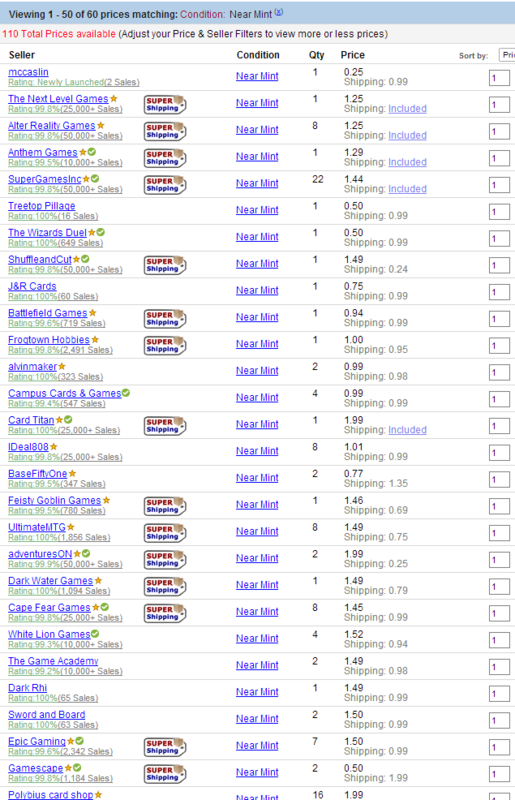 If the buylist on those $3 cards is $2.25 though, you’re in good shape. Even if the card fails to do anything, you can get out having lost only 25% of your purchase. Obviously nobody wants to be in that boat, but it’s nice to know that you have an out that isn’t going to be soul-crushing. Wow, is that what TCGPlayer looks like to you Americans? Fortunately, I’m only following to find out what to avoid buying. She’s a generic angel which show up in nearly every single set. That isn’t to say that Linvala is getting printed in Journey Into Nyx, but it’s far more likely we’ll see her there rather than another printing of Birthing Pod. I realise you were speaking in generic terms, but we already know that there are no angels in Theros, for obvious reasons! The likelyhood of either is exactly zero. That’s a good catch. I don’t think I elucidated that section fully. While Linvala is indeed named, angels show up in nearly every set. Faeries are much more uncommon as a theme. “Vendilion” also ties into the flavor of Lorwyn, while “Linvala” has no inherent ties to ROE. Linvala could easily show up in a core set, but it is much less likely we would see Clique.